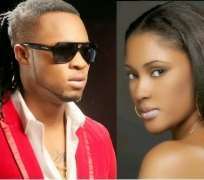 Few months back, news hit the Blog sphere about talented Musician, Chinedu Okoli popularly known as Flavour's love life. According to the source, we learnt the Enugu State born singer is in sizzling romance with Former Most Beautiful Girl in Nigeria, Anna Ebiere Banner. This rumor mongers equally informed that the light skin musician must have dumped his lover of many years, Orange Drug Beauty Queen, Sandra Okagbue who a had a daughter for him few months back. According to them, Flavour and the Ex- Delta Soap Beauty Queen were inseparable, cohabited as live in lovers and gave people the confidence that the future holds them together as husband and wife. Before they could blink their eyes, Flavour has dumped Sandra for Anna. We were also informed that it is heartwarming to his colleagues and friends, as they have waited many years for Flavour to take their enviable relationship to the next level, but to no avail. However, Flavour's heart seems to be with Anna Ebiere as we learnt that the Ada Ada crooner is making secret and candid plans to walk down the aisle soon with Anna Ebiere, although he's denying that in most of his interviews in other not to court any controversy. Flavour knows that any form of controversy in his career at this point in time, may dwindle his career and affect the sales of his newly released album ' Thankful'. Flavour has not only been flaunting his relationship with Anna, he also featured her in his new video ' Golibe ' where he professes his undying love for her. The video depicts what true love is all about and how love conquers all.